A range of ‘Alzheimer’s cushions’ spread out before the backdrop of Ann’s beautiful quilt. In the run-up to Christmas last year, Alzheimer’s Scotland launched their newest initiative which was the Alzheimer Scotland Action on Dementia Tartan that I designed for them. They made a delightful video advert called ‘Tartan Christmas’ which was hugely popular. I was invited – with my own glasses and grey hair – to be an extra in the café scene which was a very great pleasure. You can read more about the making of that advert here. The haunting music was the soundtrack of ‘Vanishing Act’, recorded by the very talented Edinburgh-based singer-songwriter, Jonathan Pennington-Twist. The point of this preamble is really to highlight just one of the very many marvellous examples of promotional work that the Alzheimer’s cause attracts. At the official launch of the tartan I was delighted to meet the very well-known quilter Ann Hill who was born in the small town of Lerwick in the Shetland Islands. She now lives in the tiny rural village of Mouswald, just outside Dumfries in southwest Scotland – famous as the home of the poet Robert Burns. Ann picked up a love of quilting from her grandmother’s quilts and she is currently Quilter in Residence at Alzheimer Scotland and Dumfries and Galloway Royal Infirmary where she works with people with dementia and their families. She also teaches quilting throughout the year, mostly in Dumfries. Well . 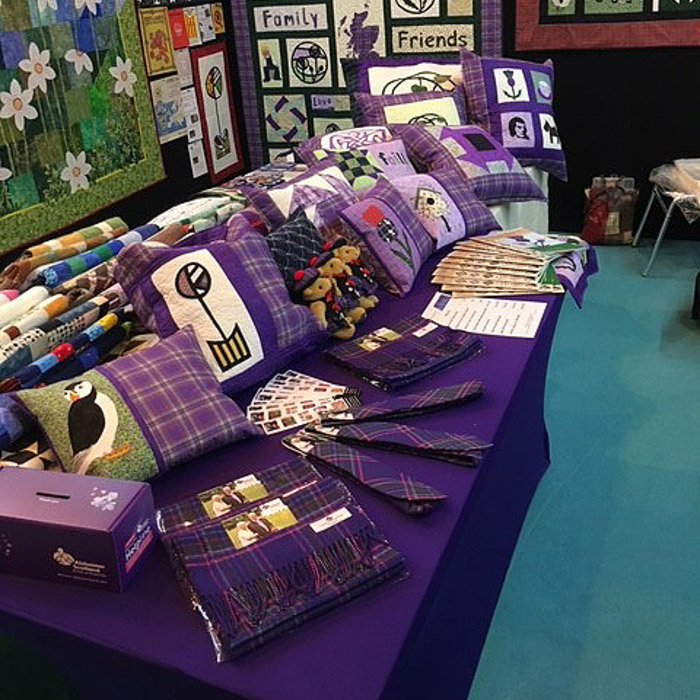 . . Ann seized upon the new tartan with great enthusiasm, had some printed in cotton and started work on an Alzheimer’s Quilt which went on exhibition in Glasgow early this year at the Knitting and Stitching Show. Author and lecturer Ann made an astonishing £4,000 and took an order for the quilt raising £2,000. All her proceeds go to Alzheimer Scotland and to date, she’s contributed a massive £87,000 from quilting and is aiming for £100,000 goal! The tartan project was initiated by the dynamic and talented Anna Devine, Director of Fundraising and Marketing, Alzheimer Scotland. 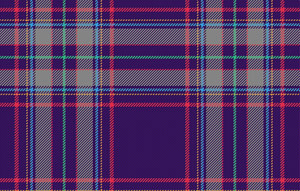 Have a look at www.alzscot.org/tartan for some tartan products. This signature Alzheimer Scotland Action on Dementia tartan is the world’s first tartan in recognition of the millions of people across the globe affected by dementia. It takes inspiration from the bright purple and pink colours of the Alzheimer Scotland charity logo and brand, together with the contrasting colours of the charity’s secondary colour palette. The design pattern itself takes into consideration the importance of memories and heritage and is influenced by the more traditional look of the ancient Royal Stewart tartan. The Alzheimer Scotland tartan is a beautiful vibrant tartan with memorable qualities that reach across all generations and continents. Designed by Brian Wilton MBE and donated to Alzheimer Scotland Action on Dementia by the Scottish Tartans Authority.